"I want to go down on the ship with my fist raised. But I don't take myself too seriously," says actor and director Mark Duplass. Watch as he discusses filmmaking, signing big name actors, being frank about the creative process. Stark Insider continues the countdown to Mill Valley Film Festival 36 (Oct 3). We preview some of the films that will be screened at the 11-day festival. Also, as we’re doing here, we look at some of the “best of” pieces. Mark and Jay Duplass swung into town to MVFF34 a few years back with ‘Jeff, Who Lives at Home’. Update: Kevin Pollak, seen interviewing Mark Duplass below, has successfully completed a Kickstarter campaign for a documentary (his directorial debut) about the dark side of comedians, ‘Misery Loves Comedy’. Mark Duplass should know, he watches a lot of them. Follow his Twitter feed, and you’ll get continual Netflix recommendations, including many gems that would otherwise might go unnoticed. Picks from last week included Soderberg’s Side Effects and Sundance “sleeper” This is Martin Bonner. The actor/director (and writer) is known for his frank, up-front style. At auditions he doesn’t lather actors with artificial praise. Instead, he prefers to be honest, to coach them. Along with his brother Jay, he’s quickly building a reputation for being one of the best at milking improvisation to great effect. Cyrus (2010) with Jonah Hill and Jeff, Who Lives at Home (2011) with Jason Segel put the Duplass brothers at the top of the up-and-coming filmmakers list. The two appear together on screen for the first time in The Mindy Project. I was a little late on the take, but I’m glad I stumbled upon this interview that was uploaded to Blip.tv in March (see video below). Kevin Pollak’s epic, awesome web series (KPCS) has a record for getting guests to open up; I particularly like the way the show’s relaxed pacing. 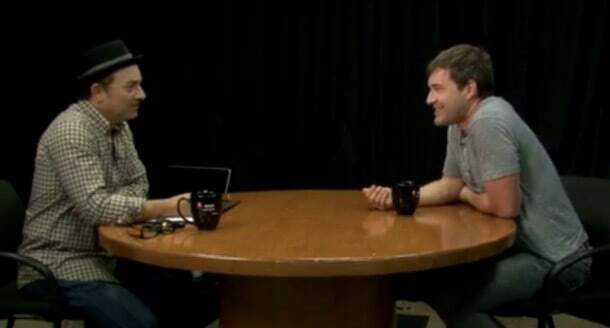 Mark Duplass in an in-depth interview on Kevin Pollak’s web-based chat show. From writing, and auditioning actors to hiring talent and keep studios at bay, this is one of the best conversations I’ve yet seen. For anyone interested not just in film-making, but also the machinations of the industry and the trials and tribulations of “making it” this is a must watch. And this is what I love about the new and improved, increasingly more thoughtful web. Long-form journalism continues to make inroads. Over the past six months I’ve noticed a flight towards deeper, more thought-provoking pieces. Sure, like everyone else I occasionally get a kick out of a Buzzfeed quick hit or an animated GIF. Look at what Fast Company or Slate are doing, however, and you’ll find great examples of quality organizations pulling our collective intellect up a notch. Kevin Pollak’s show fits the mold. There’s no B.S. – well, except for when s@#! is s@#!. There are no commercial breaks. There’s no rush to cut an interview short because a Three’s Company re-run is on deck. Okay, it might be a bit of a stretch, but in this episode squint your eyes and you might see Pollak as Charlie Rose with a smirk and Mark Duplass as, hmmm… a young Ethan Coen. Dig a little into IMDB and other forums and you’ll see no shortage of “he’s a douche-bag” type comments regarding Mark Duplass (but not so much Jay). When Stark Insider attended the Jeff presser a few years back at Mill Valley Film Festival, nothing could have been further from the truth. Mark and Jay casually walked into the room at the Outdoor Arts Center in Mill Valley, Czech beers in hands, and thoroughly charmed, entertained and informed a small group of journalists (you can watch that video below as well). I wonder if people sometimes mistake intensity for pretension? One thing is very clear: Mark and his brother are relentlessly committed to their craft. Of course, if anything, polarizing opinion is the Valhalla of effective PR (Miley Cyrus…). Meantime, Mark’s career in front of the camera appears to be in high gear these days with a boatload of roles in television (The Mindy Project, Togetherness) and film (Reawakening, Brett Pierson, Tammy).